What if the incident did not occur within the city of Medicine Hat? If the incident did not occur within the city of Medicine Hat then you should report the incident to the local police agency for the jurisdiction where it occurred. A known suspect is when you or someone else knows the person or knows where to find the person who committed the crime. Examples include; knowing the person’s name or the license plate number of the vehicle the suspect was in. If you have a known suspect involved in your incident, please attend the Medicine Hat Police Service in person or call 403-529-8481 to file your report. A "suspect description" is not considered a "known suspect". A suspect description can be included in the incident description when entering an online report, assuming the incident fulfills the other online reporting criteria. What happens if I find something left behind by the suspect? Items that are left behind by the suspect may help to identify him/her. If there is evidence, do not file a report online. Attend the Medicine Hat Police Service in person or call 403-529-8481 to report this incident. What if I require a police file number for insurance purposes? You will receive an unofficial copy of your report as well as a temporary file number when you submit your online report. Your report will be reviewed by a police officer within 24 hours. Once it is confirmed that your online report meets the online report criteria, an official report and Medicine Hat Police Service file number will be emailed to you. Only the official file number can be used for insurance purposes. Some incidents require more information to be gathered including having an officer to be dispatched to the crime scene to conduct an investigation or others require interaction with an officer over the phone or at a police station. These incidents cannot be reported via online reporting. 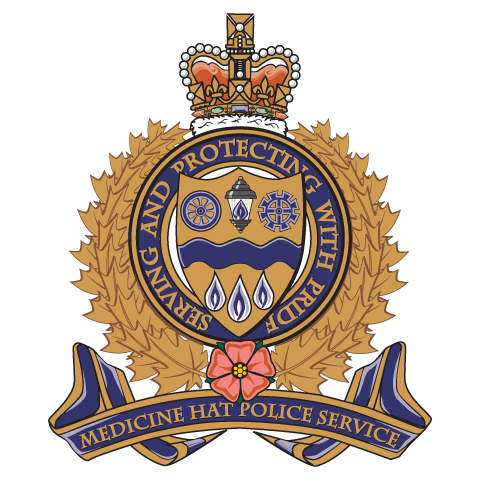 If your incident does not meet the criteria for online reporting please attend the Medicine Hat Police Service person at 884 2 Street SE, Medicine Hat or call 403-529-8481 to speak to an officer. Why can't I report a motor vehicle collision online? Due to the complexity of data that needs to be gathered and the need to verify collision details, most vehicle collisions require the attention of an officer or a Collision Reporting Center agent. Please attend the Medicine Hat Collision Reporting Center located at 884 2ST SE to report this incident. What happens to my report after I have submitted it? Your report will be reviewed by a police officer within 24 hours. You may be contacted for additional information and you will receive an email explaining the status of your report. Once approved, your report will be transferred to the Medicine Hat Police Service Records Management System to undergo standard investigative and analytical processes. Your report will be retained as per the Medicine Hat Police Service retention policy. The personal information in this online report will be collected, used and disclosed for the purposes outlined in Sections 33 to 43 of the Freedom of Information and Protection of Privacy (FOIPP) Act and other legal requirements where they are consistent with the FOIPP Act. If you have any questions regarding the collection of information, contact the Medicine Hat Police Service, Information Coordinator, 884 2 ST SE, Medicine Hat, Alberta, T1A 8H2.